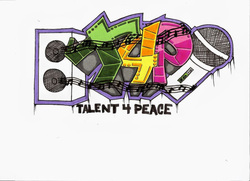 Salinas Youth Rally Talent 4 Peace is an outreach program that was started 3 years ago by Art and Cyndi Barnes. They partner with local youth groups and schools to bring an annual talent showcase to Salinas. Salinas Youth Rally: Talent 4 Peace is a rally where hundreds of young people come together to show case their talents in a positive venue in order to show that when we use our strengths and abilities in positive ways, we create unity and peace in our local communities. The Walk and Roll Foundation's Rally4Reality(R4R) program was honored to be asked to participate in this amazing rally and introduce their new dance team, Team HotWheelz(THW)! We look forward to participating in many more events with them in the future! 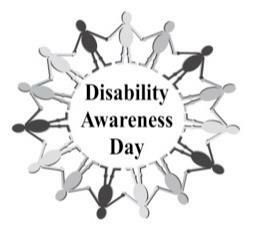 The mission of the Disability Awareness Day event is to build an integrated community by empowering people with differing abilities to overcome barriers through access to resources, education and employment opportunities and increasing appreciation of people with differing abilities by showcasing their talents and gifts. The Walk and Roll Foundation's (THW) dance team was honored to be asked to participate in this amazing rally and introduce their new dance team! We look forward to participating in many more events with them in the future! This annual event takes place in October to coincide with National Red Ribbon Week. 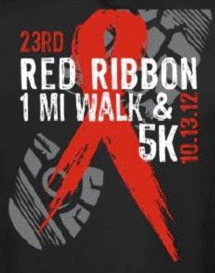 The Red Ribbon Run/Walk is in San Juan Bautista on October 13th at 9:30am; a VIP guest speaker is invited that presents their story of the dangers of alcohol/drug. The Walk and Roll Foundation's (R4R) program was there to speak and (THW) performed a routeen. These type of events hold special meaning to us at the Walk and Roll Foundation and it's always a privilege and honor to be asked to speak. We look forward to participating in many more events with them in the future! 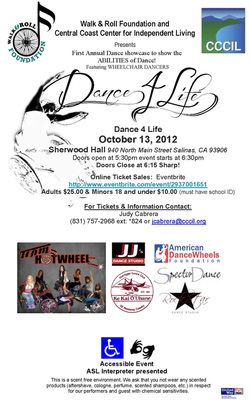 The Dance4Life event was the official launch of our Team Hotwheelz dance group. The Dance4Life event was co hosted by The Central Coast Center for Independent Living (CCCIL) at The National Steinbeck Center’s Sherwood Hall on October 13, 2012. The lineup of performers includes wheelchair dance groups from this area and special guests American Dance Wheels Foundation from PA. This evening had a very special message to inspire each of us to look beyond the chair. This was achieved by a few special people, Melissa Karasek, Sammy Ramirez from JJ's Dance studio and Che who helped choreograph the performances with wheelchairs and able body dancers. Chelsie Hill, Kaitlyn Staten, Maria Gast, Jon Hill and Kaela Lebow spoke at NMCHS. 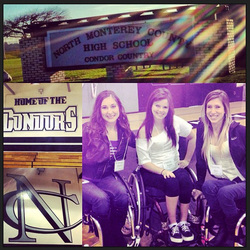 NMCHS had a week of respect and asked these girls to come in and share their stories and journey. The girls talked about what their life was like before they were injured and how they viewed people with a different ability and how/if their views have changed now. This presentation was very powerful with slide shows and 4 girls who all have different abilities. Team Hotwheelz knocked the audience off their feet at the Aquarium! They performed two amazing routines, Ali Stroker sang Titanium with to "able body" dancers from So Cal and Ali Stroker and Dani Shay from The Glee Project sang a beautiful song..